The agonized and solitary life of an artist. About The Mask Carver's Son by Alyson Richman: 1890. Yamamoto Kiyoki is a Japanese art student, dreaming of studying in Paris with the inspiring and vibrant Impressionist painters. Yamamoto Ryusei is Kiyoki’s father. Ryusei’s art, carving intricate masks for traditional Japanese theater, has been his refuge from loneliness since the death of his beloved wife, and he is revered as the most inspired artist of his kind. He expects his only son to honor the traditions of his family and his country, not to be seduced by Western ideas of what is beautiful. Ryusei hopes Kiyoki will follow his own distinguished career, creating masks that will become the family’s crowning achievement. But what is a father to do when his son’s path is not what he had planned? And how can a son honor his father, and yet fulfill his own destiny? This story has so many elements to it that I thought it would become messy -- two settings (Japan and France, look at that cover with the Eiffel Tower and cherry blossoms), a father-son story, an obscure art angle, and a rather long timeline. But what do I know about writing? Nothing obviously, as the author was able to bring all this into a coherent tale that was both enlightening and heartbreaking at the same time. This book is a peek into the traditional art of Japanese mask carving used in Japanese theatre, which is wrought with spirituality and believed to be a calling. I found this fascinating: how Yamamoto Ryusei found himself as a mask carver and how his entire life revolved around this calling. The story traces the life of Kiyoki, who was born into Ryusei's mask carving world, bound by association into this profession but whose heart lies elsewhere in the art world - Paris's Impressionism. On the cusp of old and new, Kiyoki has to decide whether he will continue with the Japanese tradition or find his own way and his own passion. This dilemma is all the more heightened because of the entire backstory of his father which depicted how much his father loved his craft, the impact on their community, and the contribution to the Japanese arts scene. On the other hand, I couldn't help but cheer Kiyoki on to find his own path. I agonized with him during his uncertain steps in Paris, his missteps, and his successes. It is difficult to read about agonized artists, artists who pour everything into their creations at the expense of everything in their lives. But is is a stereotype that continues to ring true and it makes me all the more appreciative of the art that is created and continues to be created in cultures around the world, regardless of time. Verdict: A historical fiction piece that is both heartbreaking and enlightening, bringing to sharp focus the artist life of creation, beauty, and agony. I highly recommend this to those who love the arts, have a soft spot for anything Japanese, or simply want to learn about the obscure and fascinating tradition of Japanese mask carving and theatre. I won this book in the giveaway for the Travel the World in Books Readathon last September 2014. Thanks, Tanya! Wow- this sounds like one for me! 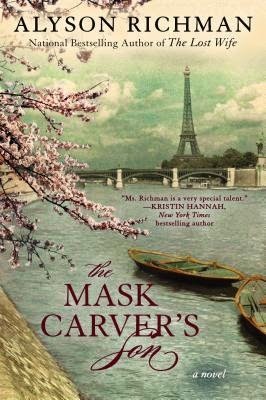 I haven't heard of Japanese mask carving, but it seems every time I read something set in Japan I end up really liking it. I'm glad you enjoyed it- great review! I'm hoping you pick this up ... it's such a fascinating book all around!